With respect to Panteleimonovka, it has been reported on the Internet forum where Strelkov used to share his briefings that it remains in the hands of the Militia – even though yesterday there were conflicting reports suggesting that it had been abandoned. It appears that there is ongoing fighting and that, just as with Miusinsk, control over this settlement continues to pass back and forth between the opposing sides. 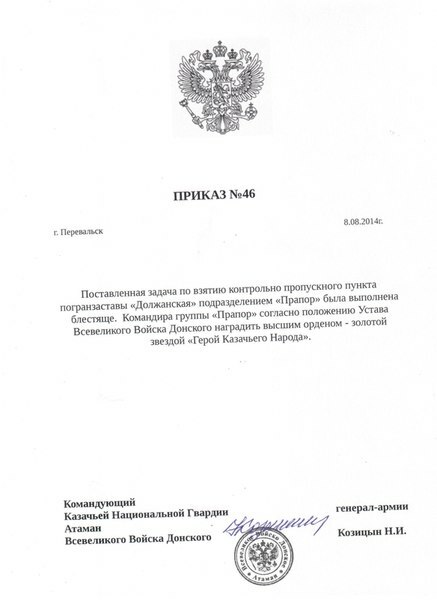 “For the successful execution of the combat mission to liberate from Ukrainian occupants the Dolzhanskiy border-crossing checkpoint, the commander of the Prapor unit is hereby awarded the highest honour – the Order of the Golden Star “Hero of the Cossack People”. 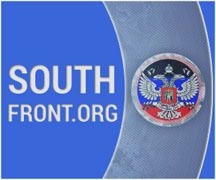 With respect to Saur-Mogila – 4 sources in the DPR were queried. Two of them confidently stated that the Militia continues to retain the height. Another one stated that the Junta forces took control – not of Saur-Mogila, but of the Saurovka village and of some numbered height. According to another, more detailed version, the top of the height was controlled by 15 militiamen. Following massive artillery shelling, they retreated from the mountain, but Junta troops are also unable to take control of the height, because our side continues to shell the top using artillery. At this time, an intense battle is ongoing there. Though I live in America, my heart is with the defenders of goodness and rightness in eastern Ukraine. May God bless them with victories until they prevail. I apologize for the shameful way the American government has acted in this matter. It serves the Devil. God is brewing a strong poison for the bastards in charge of America. He has chosen Russia and China to serve as His instruments of Justice. They will eventually introduce America to the Abyss. Here is another American of many generations wholly supporting the People of Ukraine who are even at this moment being slaughtered just like GAZA ,Libya, Algeria, Tunisia , Syria in the global bankers grinding machinery that spits out changed nations subservient to the bankers and their diabolical plans. As President Putin has held his own counsel and tried honorably to avoid the great war we all know is being forced on our world I also send him best wishes and prayer as many here in America do and wish we had such a leader so all disputes would be solved sitting round the table making common ground with each other for the Higher Good. Everyone must help as can! Send money! Critical battle at Saur-Mogila indeed. There seems to be a wicked commander of the 51st Brigade who is pressured by Kiev to take the Height 277 at all cost, preserving the lifes of his men very well. Battalion Vostok has to be careful. What about the National Guard/’Shakhtersk’/’Azov’-Battalions at the East of Saur-Mogila – are they still there holding positions? This could be a weak flank perhaps. Maybe the Artillery and the Grads should force them to retreat so that the freed up Units of the Cauldron could retake the Eastern flank of Saur-Mogila. This would also be a good position to secure the former Cauldron area and to attack the South flank of Saur-Mogila, forcing their Artillery to retreat, perhaps? What about the Permovaisk/Horlovka/Donetsk fronts – are they stable? Any news? 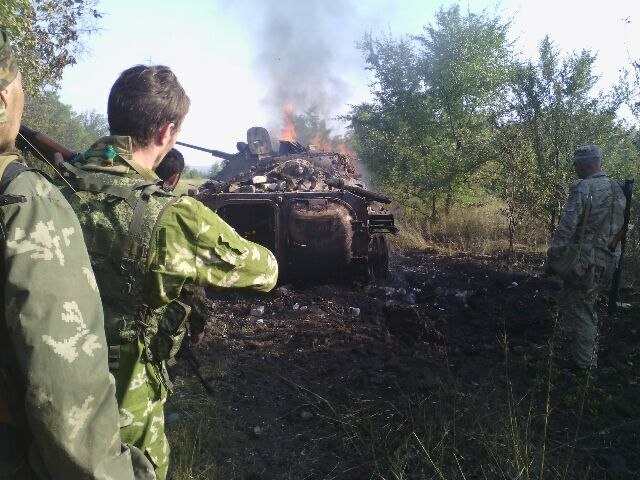 I have just learned today: YES, indeed, Militia Reinforcements retook the settlements on the Eastern flank of Saur-Mogila and defending them against a heavy counterattack successfully, stabilizing the Cauldron Version 2 … 🙂 … YES! Note that is a war crime, not to mention a disgraceful and evil act. But this imaginary SBU “soldier” boasts about killing NAF Militia when they surrender. This does two things. It encourages the Ukraine’s soldiers to do the same, and it also sends a message to NAF about how they will be treated. If the USA/Ukraine can goad NAF into responding in kind, then that will solve the biggest problem that the Ukraine government has in this war. A huge percentage of the Ukraine army has simply deserted. If the US/Ukraine government can create enough hatred between Ukrainians, then they can make desertion impossible. Note other work is being done on the desertion problem, with abuses of civilian populations, including crimes against children, specifically designed to goad the Militia into responding. A militia soldier had a video sent to him of his young son being tortured to death. Why do that? Without incredible discipline, the resulting desire for revenge will make desertion impossible. This solution is straight out of the CIA’s “School of the America’s” playbook. 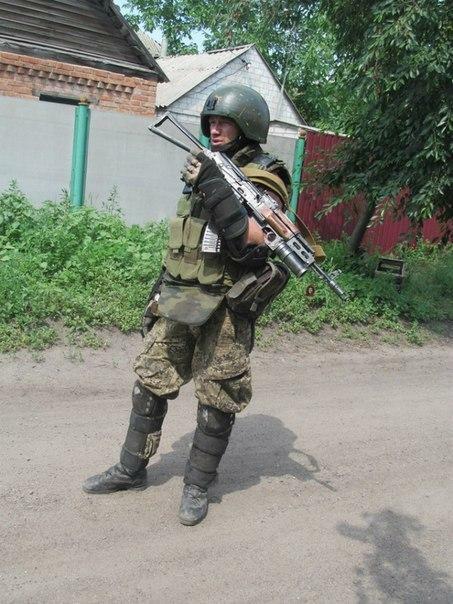 Since MH17 went down US SpecOps with South American experience have been entering the Ukraine. This is not new, its very logical, and its all been done before.